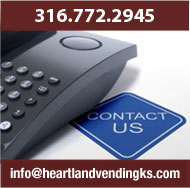 Give your spirit a lift with ice cold beverages from Heartland Vending. Heartland Vending supplies beverage vending machines along with a very wide selection of name brand sodas, waters, and delicious coffee. You get clean modern equipment that is always reliable. Plus, if you ever experience a problem, our trained technicians will have things working smoothly within 24 hours. Our popular glassfront Coke and Pepsi machines can be stocked with the full line of sodas. 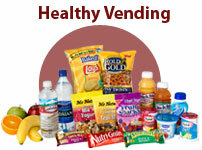 Also opt for our customer favorite, Generic Machines that let you stock any and all beverages regardless of brand! We offer an employee subsidized option that lets your company pick up part of the cost of beverages. This gives your employees and customers discount prices that are always a huge hit. 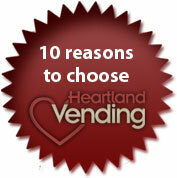 Heartland Vending's Hot Beverage Machines provide that steaming hot cup of coffee you crave! Enjoy flavor coffee, cappuccino, and tea at the press of a button. Machines are clean and modern. We offer 8oz or 12 oz cup sizes. Now employees don't have to leave work to get their coffee. You get more work done and reduce expenses with our modern office coffee service.